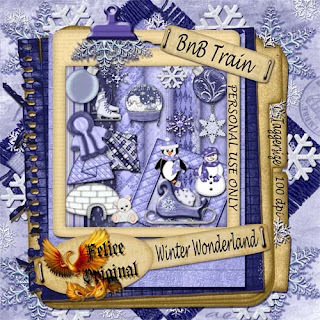 Felice Original: Choo Choo The BnB Winter Wonderland Train is leaving!!! Choo Choo The BnB Winter Wonderland Train is leaving!!! It's time for another blog train to leave his station. The BnB Winter Wonderland Train. Here are the blogs of the other designers who participate on this train. Please leave us some love when you download,cause we put a lot of efford and time into this.And this is the awsome result. Winter Wonderland contribution in a LO on my blog!!! !